Promotional finance offers are available through Citi Retail Services, Synchrony Bank, and Sheffield Financial. Offers valid 12/1/17 through 1/31/18. Select Citi offers available through 12/31/17. Please visit your local dealer for more details. *0% APR for 12 months for qualified cardholders (Kawasaki Motorcycles, ATVs, Jet Ski® watercraft, MULE™ utility vehicles or TERYX® recreation utility vehicles). After that the variable APR will be 7.99%-12.99% based on your credit worthinesss. 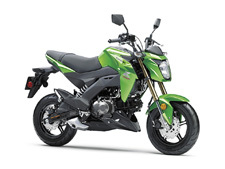 Incentives shown available at participating dealerships, on select Kawasaki vehicles. Restrictions may apply. Subject to change without notice. Offer available on approved purchases of select new, unregistered Kawasaki vehicles. Offer valid for a limited time only. *With credit approval for qualifying purchases made on the Kawasaki Card at participating dealers. Depending on credit quality, eligible purchases will be charged no interest for 12 months from the transaction date. Thereafter, you will be charged 7.99%, 10.99% or 12.99% APR depending on credit worthiness. Minimum Interest Charge $2. Valid through 12/31/17. 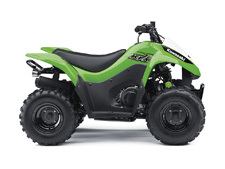 *Receive a $500 Visa prepaid card with qualifying Kawasaki side x side vehicle purchase. Valid on eligible models beginning with KAF, KRF, or KRT. Purchase must be made by 12/31/17. Not valid on prior purchases. Subject to credit approval. Visa prepaid card is given to you as a rebate and no money has been paid by you for the card. Card is issued by MetaBank®, Member FDIC, pursuant to a license from Visa U.S.A. Inc. No cash access or recurring payments. Can be used everywhere Visa debit cards are accepted. Cards expire after 6 months; unused funds will be forfeited at midnight EST the last day of the month of the valid through date. Card terms and conditions apply, see MyPrepaidCenter.com/site/visa-promo. MetaBank and Visa does not sponsor or endorse Kawasaki Card. 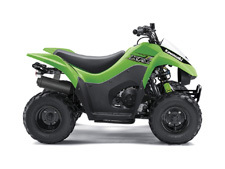 *Receive a $100 Visa prepaid card with a qualifying Kawasaki KFX®50, KFX90, KX™65, KX85, KX100, KLX®110/110L, KLX140/140L and KLX140G vehicle purchase made with the Kawasaki Card. Purchase must be made between 11/20/17 and 12/31/17. Not valid on prior purchases. Subject to credit approval. Visa prepaid card is given to you as a rebate and no money has been paid by you for the card. Card is issued by MetaBank®, Member FDIC, pursuant to a license from Visa U.S.A. Inc. No cash access or recurring payments. Can be used everywhere Visa debit cards are accepted. Cards expire after 6 months; unused funds will be forfeited at midnight EST the last day of the month of the valid through date. Card terms and conditions apply, see MyPrepaidCenter.com/site/visa-promo. MetaBank and Visa does not sponsor or endorse Kawasaki Card. Monthly payments required. 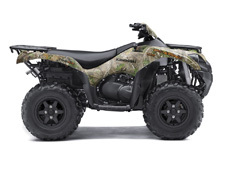 Valid on Amount Financed of $5,000 or more of select new previously unregistered Kawasaki Motorcycles, All Terrain Vehicles, Personal Watercrafts, MULE™ utility vehicles, TERYX® recreation utility vehicles made between 12/1/17 and 1/31/18 on your Kawasaki / Synchrony installment loan account. Model & year exclusions apply. Monthly payments required. Valid on Amount Financed of $2,500 or more of select new previously unregistered Kawasaki models made between 12/1/17 and 1/31/18 on your Kawasaki / Synchrony installment loan account. Model & year exclusions apply. *Rate of 3.95%, 9.95%, 12.95%, or 13.95% will be assigned. Example of monthly payments over a 36-month term at a 3.95% rate: $29.50 per $1,000 financed; and over a 36-month term at a 13.95% rate: $34.15 per $1,000 financed. Program minimum amount financed is $2,500 and 0% – 10% down payment required. Rate and down payment based on credit approval criteria. Offer is subject to credit approval by Synchrony Bank. Monthly payments required. Valid on Amount Financed of $5,000 or more of select new previously unregistered Kawasaki models made between 12/1/17 and 1/31/18 on your Kawasaki / Synchrony installment loan account. Model & year exclusions apply. *Rate of 5.95%, 9.95%, 12.95%, or 14.45% will be assigned. Example of monthly payments over a 60-month term at a 5.95% rate: $19.31 per $1,000 financed; and over a 60-month term at a 14.45% rate: $23.50 per $1,000 financed. Program minimum amount financed is $2,500 and 0% – 10% down payment required. Rate and down payment based on credit approval criteria. Offer is subject to credit approval by Synchrony Bank. *Example: On a purchase where the Amount Financed is $7,500, your Down Payment is $0 with 36 monthly payments of $221.29 each. [ANNUAL PERCENTAGE RATE 3.95% (E)]. *Example: On a purchase where the Amount Financed is $7,500, your Down Payment is $0 with 72 monthly payments of $131.35 each. [ANNUAL PERCENTAGE RATE 7.95% (E)]. *Example: Tier A Customers: On a purchase where the Amount Financed is $7,500, your Down Payment is $0 with 60 monthly payments of $144.85 each. [ANNUAL PERCENTAGE RATE 5.95% (E)]. *Example: Tier B Customers: On a purchase where the Amount Financed is $7,500, your Down Payment is $0 with 60 monthly payments of $159.21 each. [ANNUAL PERCENTAGE RATE 9.95% (E)]. *Example: Tier A Customers: On a purchase where the Amount Financed is $7,500, your Down Payment is $0 with 66 monthly payments of $135.45 each. [ANNUAL PERCENTAGE RATE 6.49% (E)]. *Example: Tier B Customers: On a purchase where the Amount Financed is $7,500, your Down Payment is $0 with 66 monthly payments of $150.08 each. [ANNUAL PERCENTAGE RATE 10.49% (E)]. *Example: On a purchase where the Amount Financed is $7,500, your Down Payment is $0; no interest FOR 6 MONTHS with 60 monthly payments of $152.89 each. Interest Rate is 9.95% [ANNUAL PERCENTAGE RATE 8.23% (E)]. ANNUAL PERCENTAGE RATE subject to increase after promotional period.